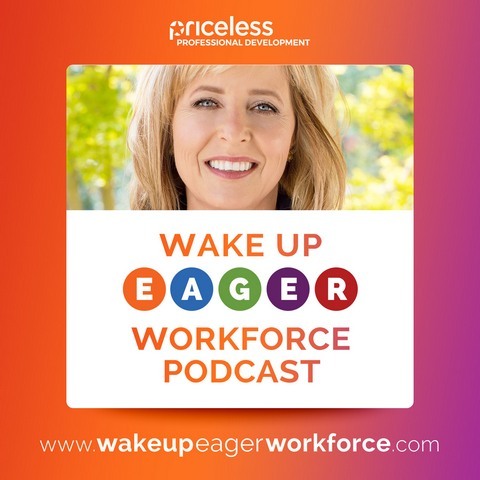 Welcome to the Podcast designed to help leaders hire and promote the right people, and build and sustain an energetic, committed and drama-free workforce, helping you reduce turnover and improve productivity. Do YOU have a Wake Up Eager Workforce? Get best practices, tools and resources here! Podcast Episode #53 Feed Intrinsically Starved Employees: What? Why? How? Podcast Episode #35 How to Handle Conflict Like a Pro - Four Crucial Steps - P.R.E.P. Helping leaders, trainers and consultants, everywhere, build a Wake Up Eager Workforce. Insightful insider tips and best practices. Access to some of the top training and development resources for consultants and organizations. Revealing employee selection and development expert interviews. Detailed reports on the latest training and development research and conferences. Helpful guidance and action steps for building energy, commitment and communication in organizations. Ongoing motivation, encouragement and support for all of your hiring and development efforts. If you're not on my email newsletter list yet, sign up here to get updates. on your smartphone anytime, whenever you want. Would You Share Your Feedback? Because I know your time is precious and that your feedback will be valuable - if you take time to complete the short survey below, you will receive a complimentary copy of my book 120 Stress Management Strategies for Professionals. The complimentary coupon code for this book will be provided to you once you complete the survey and click the - Submit My Feedback & Get My Book, Now - button, at the end of the survey. If yes, how many hours do you listen a week? What other topics would interest you?